Adam, Kevin and I have been working on a secure kegerator project. 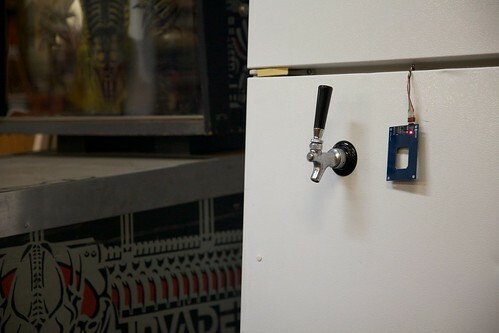 We made a kegerator that uses an Arduino Duemilanove with an RFID reader for access control, a solenoid for controlling the tap and a flow meter for recording how much beer was dispensed. We are reusing our Makerspace keycards and fobs for access. The system is pretty simple and only has a few components. We’ve done a couple of iterations on it so far and are currently working on a custom-etched Arduino shield for the components. 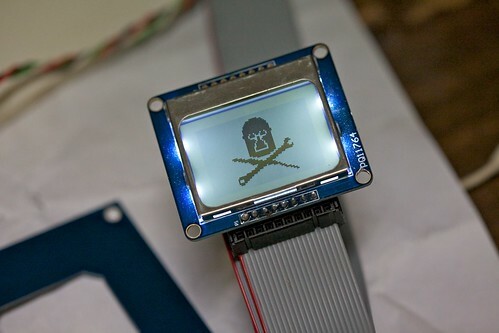 While the system currently uses a little Nokia 5110 screen from AdaFruit, we are also working on a version that uses an android phone for display, data logging and cloud-connected goodness. 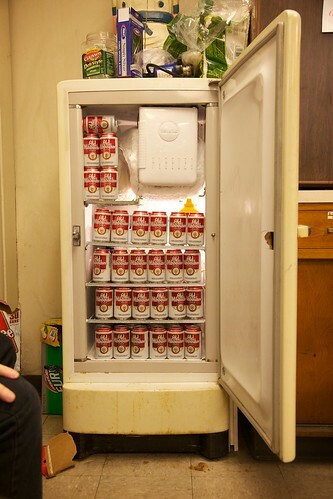 The old, tired way of storing and dispensing beer relies on cans and refrigerators. This simply won’t do for today’s tech-savvy connoisseur. Our kegerator has an RFID reader that hangs off the front. This shot is from an earlier version that did not have a screen attached. Classy. The screen has a glorious 1-bit Milwaukee Makerspace logo (courtesy of the generous folks at RasterWeb, Inc.) and an inviting message. After the beer is poured, the amount of beer dispensed will also be displayed. The kegerator is very perceptive. 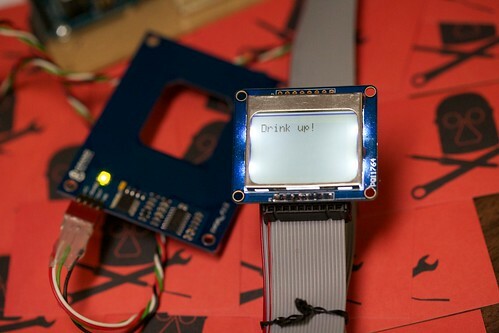 It uses advanced computer vision to detect that you are thirsty and suggests that you would like a beer. 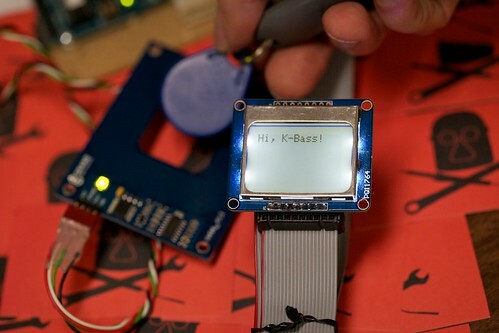 Kevin uses his Makerspace keyfob to badge in and is greeted by his stage name. With his identity verified and his tankard filled with a tasty brew, Kevin can do nothing but obey. 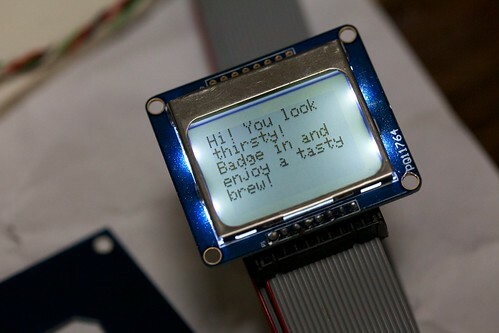 This entry was posted in Uncategorized and tagged arduino, beer, keg, rfid, solenoid. Bookmark the permalink. I have my own dispenser project I hope to make some day, but I named it my “Specific-Gravity Controlled Newtonian Fluid Dispense-o-matic.” Naturally, it features lots of brass and gears. Hmm, seems like the next step is to have a few taps and create a link to Pintley’s API so it can pick your next beer for you! Cool project!! What solenoid and flow meter did you guys use? Any plans to release the source? +1! I’d love to see more info on the hardware used and some source. Help your Canadian Brethren dispense beer as well! Thanks the links, feedback and comments! The board is very much in flux right now, so no releases just yet. Things are changing every time we get together to work on it. Very nice! I think we need something similar at the Bloomington, IN hackerspace (Bloominglabs). Would be very cool to get some more details on the hardware if you have the time and inclination. We’ll watch out for the BeerShield. I have a old Pepsi cooler, the type where you feed in money open the side door and pull out a bottle of Pepsi, or in my case beer. I like this idea and will see about integrating something similar into my cooler.